Sentinel Hand guards - PowerMadd is excited to introduce our latest hand guard offering! The Sentinel Hand guard is designed to be the most stylish, durable and functional hand guard to date. A bit larger than our Star Series hand guard, the Sentinel offers you more protection with an updated look and great accessories. The mounting brackets are 6061 aluminum, while the guard itself is made of two different types of plastic-a stiff two piece spine for durability, and a softer colored body for flexibility. Requires ONE of the Sentinel Mount kits: 34450 Snowmobile, 34452 ATV/MX, 34454 Snowmobile - Hayes Brake or 34269 Tri-Mount. SOLD AS PAIR. 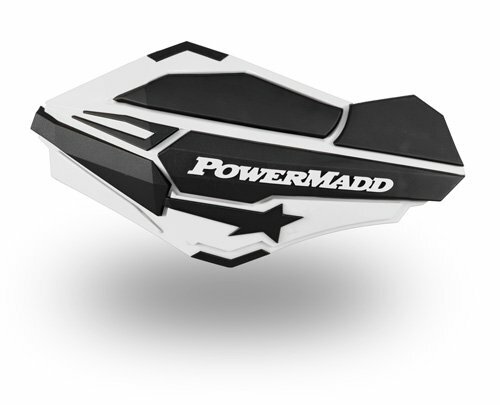 If you have any questions about this product by PowerMadd, contact us by completing and submitting the form below. If you are looking for a specif part number, please include it with your message.